The macronucleus contains microtubules that lie inside a seemingly intact nuclear envelope. Microtubules orient along the axis of macronuclear elongation in the form of small bundles. The section is immunogold labeled with anti-b-tubulin. 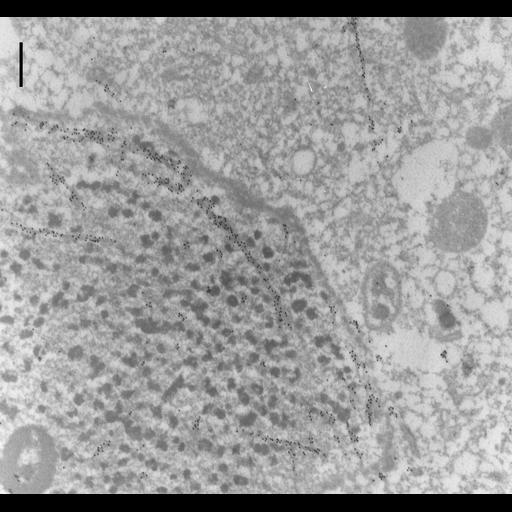 TEM taken on 7/5/96 by R. Allen with Zeiss 10A operating at 80kV. Neg. 12,000X. Bar = 0.5 µm. Cells were lightly fixed with 0.25% glutaraldehyde and infiltrated with 2.3M sucrose before being frozen in liquid nitrogen and thin sectioned at a temperature of –100°C at approximately 75nm thickness. Frozen sections from these preparations were then thawed, washed, and exposed to a monoclonal primary antibody that was raised in mice or rabbit/goat and to colloidal gold-complexed goat-anti-mouse/rabbit secondary antibodies. Further details of preparation are detailed in Methods Cell Biol. 2010;96:143-73. The negative was printed to paper and the image was scanned to Photoshop. This digitized image is available for qualitative analysis. An unprocessed, high resolution version of this image (CIL:1310) is in the library and available for quantitative analysis. Additional information available at (http://www5.pbrc.hawaii.edu/allen/).